Over three million people have tweeted about it by now. 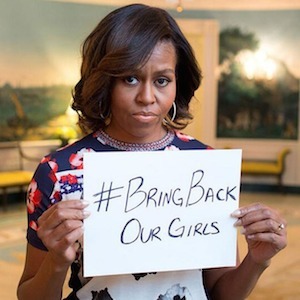 The #BringBackOurGirls Twitter campaign has seen a phenomenal uptake, with heads of state (and their wives), movie stars and women’s rights leaders all joining in to highlight the plight of the more than 200 school girls kidnapped by the militant Islamist group, Boko Haram, in north-eastern Nigeria last month. However, criticism of the campaign is mounting, with some comparing it to the ill-informed Kony2012 viral campaign to hunt down the Ugandan Lord’s Resistance Army leader, Joseph Kony. What is behind this ‘hashtag-activism?’ And will it really change anything for the victims? After all, nothing came of the Kony campaign. Rather, world leaders and politicians should act instead of sending tweets. Yet, it seems something is being done – at least in the short term. For the first time last week, Nigerian President Goodluck Jonathan agreed to accept help from international partners like the United States, Britain, France and perhaps even China and Israel. Reuters reported on Tuesday that US surveillance aircraft were being deployed to try and track down the missing girls. What is behind this 'hashtag-activism?' And will it really change anything for the victims? A security summit is also being planned in Paris this weekend, where Jonathan is expected to meet with Western leaders and some from Nigeria’s neighbouring states. But it wasn’t online solidarity alone that got the world talking about the tragedy playing out in Nigeria. A number of factors converged to force the Nigerian government into doing something about the kidnapping of the schoolgirls by the radical Islamic group. Whether those doing the retweeting are aware of it or not, Nigerians – especially women – have mobilised in protests across the country to urge the government to search for the missing girls. This, as well as the awareness raised by the Twitter campaign, led to protest actions in various capitals, from Johannesburg to London, to publicise the issue. In addition, the World Economic Forum (WEF) for Africa, which was held in Abuja last week, unintentionally led to renewed interest in Boko Haram’s reign of terror that has caused thousands of deaths in the north of the country, as well as in Abuja. Ironically, the WEF meeting was meant to be a triumph for Nigeria, having recently announced that its rebased GDP figures make it the biggest economy in Africa. Instead, the abduction of the schoolgirls – and the Nigerian army’s failure to locate them – was a huge embarrassment for the country. To have so many important people gathered at the meeting, only for the conversation to turn to Boko Haram, must have been devastating for Jonathan and his government. Anton du Plessis, Managing Director of the Institute for Security Studies, who participated in a panel discussion at the WEF last week, says the discussions at the WEF might have encouraged the Nigerian government to manage the issue with greater urgency. ‘The leadership in Nigeria can’t hide behind their inappropriate responses to Boko Haram. I think you’ll see progress that you might not have seen had the WEF not taken place at this time,’ says Du Plessis. For years, analysts and observers have warned against human rights abuses by the Nigerian military, and of the risks posed by a purely military response to the threat of Boko Haram. The politicising of counter-terrorism strategies in the run-up to the 2015 presidential elections has also been highlighted. Yet, almost for the first time now, cable television networks are sending their reporters to Nigeria to tell the story of the desperate mothers of Chibok, who are the latest victims of a scourge that has haunted the region for years. Certainly, there is a risk of the oversimplification of complex issues – such as Nigeria’s north-south and Muslim-Christian divides – by perhaps well-meaning media campaigns. The choice of vocabulary could, for example, be of great importance. While the Nigerian media have always referred to Boko Haram as an ‘Islamic sect,’ some are now calling members ‘Islamic militants,’ which could give them a veneer of respectability for jihadists around the world. Many questions remain unanswered. To what extent is Boko Haram linked to al-Qaeda? And how many members does it have? Du Plessis says it is surprising how little even the Nigerian government knows about the group. ‘We need to understand where they are and how they get their money. If, for example, they are getting it through organised crime, it means one cannot deal with the problem through a purely anti-terrorist response,’ he says. While there probably has to be some military involvement, it is clear that the government can’t ‘shoot its way out of this,’ says Du Plessis. Many mistakes were made in past dealings with the sect, and historical factors, such as the lack of infrastructure in the north of the country, will affect how the issue should be dealt with in the longer term. The #BringBackourGirls-campaign was started on 23 April by a Nigerian lawyer, and has now become a worldwide issue. But social media campaigns are frivolous, to say the least, and the media frenzy can die down as quickly as it started. The world’s attention span is very short: lasting responses are now in the hands of the Nigerian government.